Eric Carle’s The Very Hungry Caterpillar has delighted generations of readers since it was first published in 1969 – selling more than 45 million copies worldwide and captivating readers with the colorful, hand-painted tissue collage illustrations. This timeless classic leaps off the page and onto the stage in a new critically acclaimed production. 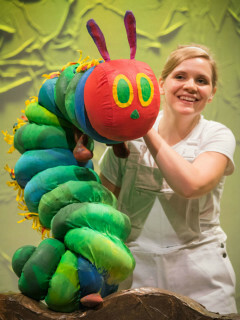 The Very Hungry Caterpillar Show features a menagerie of 75 charming puppets, faithfully adapting four Eric Carle stories: Brown Bear, Brown Bear; 10 Little Rubber Ducks; The Very Lonely Firefly; and of course, the star of the show – The Very Hungry Caterpillar.